LED lighting technology has come a long way over the past couple of years. The light emitting diode has evolved from its limited usage in indicator lights, displays, and flashlights to near universal usage in a wide range of applications such as aviation and automotive lighting, traffic signals, outdoor and indoor lighting, and more. LEDs now come in many different shapes and sizes, and can provide varying wattages, light temperatures, and brightness levels. 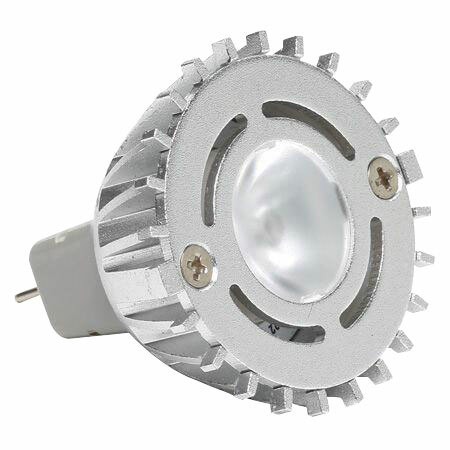 Our MR11 LED bulbs can provide an energy efficient alternative to your halogen lamps. Our MR11 LED bulbs are powerful replacements for halogen lamps, and they provide a comparable brightness and light quality while remaining much more efficient than traditional halogen bulbs. With these bulbs, you can expect up to 80% energy savings with useful lifespans of anywhere from 25,000 to 40,000 hours. We carry high quality replacement bulbs from trusted brands such as Green Creative and Halco, so you know you are getting a great product. These bulbs have a GU4 base type, so they'll fit into your existing fixtures. LEDs use semiconductors to run a current to a diode which emits light, so they don't require a filament. This affords LEDs much more efficiency and a higher lifespan, and they don't contain mercury, so they are more eco-friendly than other types of lights, and they make for a cost-effective replacement for your old halogen lamps. Atlanta Light Bulbs has been working with businesses, lighting contractors, and electricians since 1981 to provide the most cost-effective and energy-efficient lighting solutions for our clients. We know lighting like the back of our hand, we have extensive knowledge of the many lighting technologies available in the field, and we know the relative strengths and weaknesses of each technology. We have substantial experience with energy-saving LED retrofits and upgrades, and we can help you find the lighting products that match your specifications. Need help finding the right product for your halogen lamp replacement? Call us at 1-888-988-2852 and we can help you find an LED replacement that fits your requirements. You're also welcome to shop our sizable inventory of LED lighting products to find the particular product you need. Shop for your MR11 LED bulbs today!